Using one or more of these techniques will help to make the baby feel secure, comfortable and calm. They are also excellent techniques to use when putting your baby to sleep. Visit http://www.thehappiestbaby.com/ for more information on the book and the techniques mentioned! I can't wait to become a mom so I can put Dr. Karp's words into action! 1.) DVDs and video games for children under the age of 3 are overstimulating and unnecessary. As a result children are not learning how to use their imagination and to play creatively on his/her own. 2.) Children associate with characters such as Dora the Explorer and Barney. Children than begin to want anything and everything that is associated with these characters (tooth brushes, books, cereal, etc.). Children are being targeted and viewed as ways to earn more money for consumer companies. This book is a must read for every parent! The mantra enough is enough rings true and should be heeded! 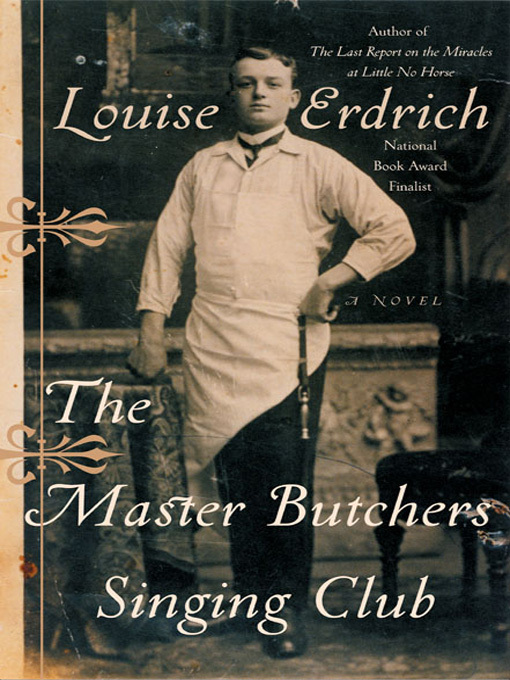 The Master Butcher's Singing Club by Louise Erdrich was the third and final book I read this past week. I started out not enjoying the book. After the third chapter I was even tempted to put the book down and never pick it up again. Luckily, however, I was patient (which is unusual for me) and I continued reading. The novel traces the life stories of Fidelis, a German butcher and Delphine, an attractive traveling performer. As a side note: the word fidelis means "faithful" in Latin and Delphine means "calmness" in Greek. Unforeseen life circumstances allow Fidelis and Delphine's paths to collide in the small town of Arugus, North Dakota. Murders, illnesses, tragedies and disappointments circle around this small town to seemingly no end. As the reader we desperately want both Fidelis and Delphine to find happiness and contentment. The book is set between the difficult and trying years between WWI and WWII. The novel is well written and executed. I would recommend this book to anyone who enjoys reading historical fiction and subtle, not overly dramatic love stories. Thank you so much for your mention of Dr. Karp's book on your blog. Are you familiar with Dr. Karp's, The Happiest Baby on the Block DVD and the Super Soothing Calming Sounds CD? The DVD is one of the best tools for parents to use to learn Dr. Karp's methods, in addition to his book. It's very visual and instructional so most new moms find this visual approach a much simpler and faster way to learn Dr. Karp’s great techniques. (Dads love watching this very “hands-on” DVD, too!). Dr. Karp’s 5 S’s technique as shown on the DVD soothes crying infants within minutes and helps babies sleep. Strong white noise is also a key point to having your baby sleep longer at night. Many parents love our CD because it can add 1-2 hours to the baby's nighttime sleep.